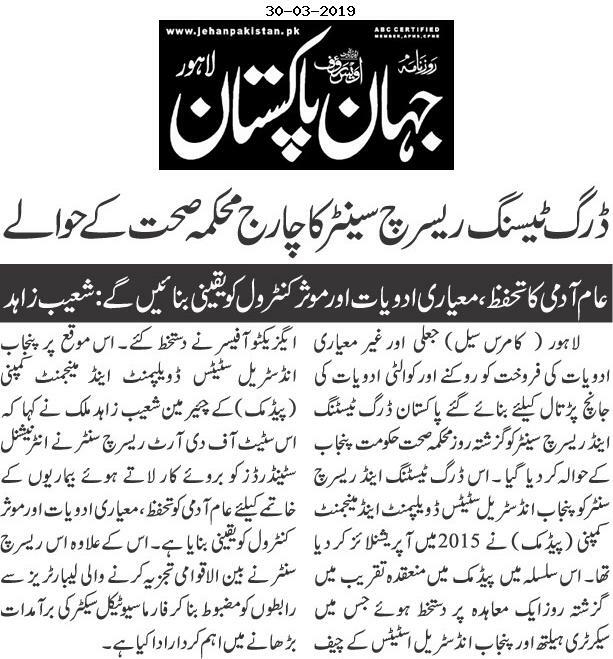 Lahore (PR) Pakistan Drugs Testing & Research Center (PDTRC) was handed over to the Health Department, Govt of Punjab by Punjab Industrial Estates Development & Management Company. It was founded in 2015 to test and research drugs in order to control fake drugs in the market. The minister for Industries, Commerce, Investment & skill development Mian Aslam Iqbal signed an agreement of handing over the reins of the Center to Minister of Health Dr. Yasmin Rashid. PDTRC is a certified ISO 17025:2015 laboratory. It has also cleared two audits of pre- qualification of World Health Organization. At this occasion Chairman Punjab Industrial Estates Development and Management Company Mr. Shoaib Zahid Malik said that the state of the art drug testing facility has worked tirelessly to provide common man safe and quality medicines. He added that this research center has helped in increasing pharmaceutical exports by collaborating and strengthening its relationship with other international standard laboratories. To view all news, Click here.